— Gardai regularly tweet about motorists exceeding urban limits by 50% or more. Speed detection data in urban areas in Galway and Mayo show that speeding in urban areas is a significant issue with speed limit compliance as low as 2% in one location and less than 50% in another. The speed limit data is from a community group in Galway, and official data from Mayo County Council. Postings by ‏@GardaTraffic — the official account of the Garda Síochána Traffic Corps also shows how widespread the issue is across the country. Examples of recent checks by Gardai included drivers clocked at the following speeds and locations which are 50km/h roads: 84km/h and 72km/h on the Merrion Road in Dublin; three detections between 82km/h and 90km/h on the Quincentenary Bridge in Galway; 76km/h in Ballinacurra, Co Cork, 76km/h on the Sean Moore Road in Dublin; 92km/h in Kilmacthomas, Co Waterford. Galway and Dublin seem to be a popular spot for Gardai highlighting speeding on Twitter; another two examples include 121km/h on a 50km/h section of the Tuam Road in Galway in heavy rain; “several” drivers at over 75km/h in Bluebell in Dublin and a motorcyclist at 117km/h on an unidentified 50km/h road in Galway. In 60km/h zones there were also a number of examples extremely high speeds, including: Gardai catching a motorist at 126km/h on a 60km/h section of Naas Road in Dublin in wet conditions; four motorists traveling “in the low to mid 90’s” at Clondrinagh in suburban Limerick; and a car traveling at 98km/h on the N11. Nearly all of the above mentioned locations include no or a minimal level of segregation between motorists and people walking and cycling, as well as at-grade crossings for cyclists and pedestrians. In Galway, walking and cycling campaigners at the Community Road Safety Action & Information Network (Cosain) used a commercially-available radar speed gun to record speeds at Parkmore Road in Galway — the area is a residential suburb as well as an access route to a large business park and a link road between the N17 and the N6. The road has narrow cycle lanes. As we reported last week, a planned redesign of Parkmore Road was rejected by the planning authority, An Bord Pleanála, which said that there was too great of a difference between the proposed design and guidelines which aim to make roads safer and attractive for walking and cycling. On the existing road, two motorists were recorded at maximum speeds in excess of 100 km/h in main speed survey, while spot checks to “provide additional evidence of the extremely dangerous speeds known to occur in this residential area” found a car driver was seen travelling at 121 km/h on the evening of June 26, while a motorcyclist was clocked at 132 km/h around 8pm on August 3. 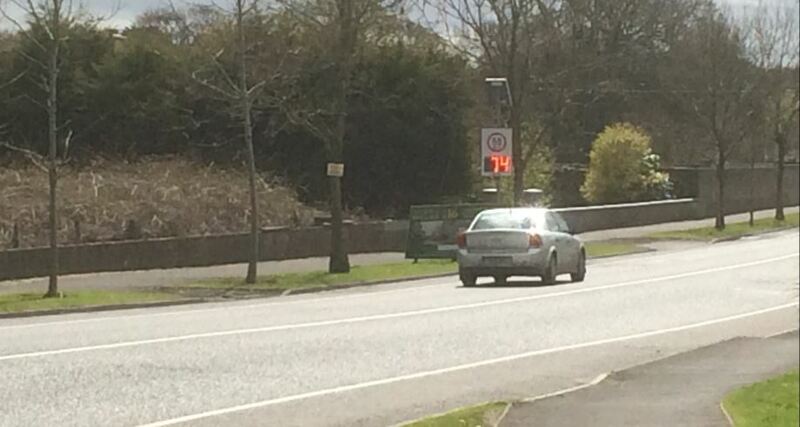 IMAGE: A speeding car passes a speed detected sign beside a narrow cycle lane in Ballina, Co Mayo. Cosain regularly does speed checks in Galway city, but it said that these were the highest speeds recorded by it “anywhere in the city to date”. Ireland is one of the few countries which does not use fixed speed cameras in urban areas. The only fix camera system in operation in Ireland is in the Port Tunnel motorway and it was only decided recently that it would be used for enforcement after a new legal view was issued that no new law was required to use the camera in prosecutions. Ireland is not the only place to struggle with the concept of fixed speed cameras. Bike Portland, a cycling news website covering Portland in Oregon, has covered the struggle between city and state authorities over the use of fixed speed cameras. But Bike Portland has reported that the first of such cameras, which was recently installed in a 40mph (60km/h) zone, is already viewed as a success. Meanwhile, sample data released by Mayo County Council to IrishCycle.com under envirenmental freedom of information laws shows high speeds every hour of the day in two 50km/h zone locations in Ballina, Co Mayo — the Foxford Road and the Killala Road, both well within the urban built up area of the town. The data was recorded on speed detection signs which are designed to alert motorists to their own speeding in an attempt to slow them down, but, unlike such signs in Portland and elsewhere, there’s no enforcement function for such signs in Ireland. The data released was for the hours between 7am on Friday February 20 2016 to 7am on Saturday February 21. The data recorded includes the speeds of bicycles, tractors and Friday evening rush hour traffic, which lower the overall speeds recorded. 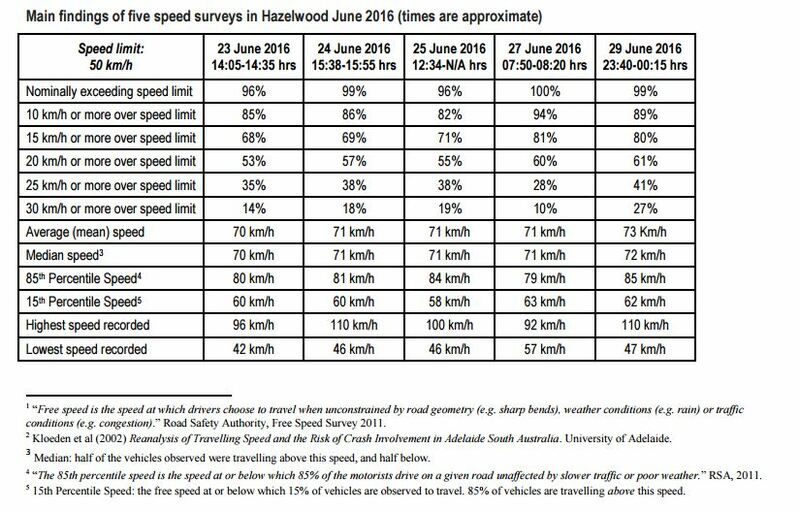 The highest recorded speed was 97km/h between 9am and 10am on the Friday morning, and 98km/h between 7am and 8am on a Saturday morning. The percentage of passing vehicles recorded over the limit was 23.85% at the Foxford Road location and 53% at the Killala Road location between 7am and midnight on Friday. Speeding increased at both locations between midnight and 7am on Saturday — with speeding at 51% and 64% in those hours at the respective locations. And this phenomenon of cars and their drivers is exactly why The Netherlands is full of all kind of physical speed breakers. The Naas Rd example is particularly unfortunate (126km/h); it’s not like there isn’t enough room to engineer good cycling facilities away from the main road. Thanks Cian. Just to note that “travelling” is spelled incorrectly a couple of times in the article. When the subject of speed limit enforcement comes up people generally complain that the cameras are only put in places where there is no issue with speeding (shooting fish in a barrel, simply for money). Presumably these people feel that none of these examples are a real issue. Sure it’s a grand straight road, and I know it like the back of my hand. Cyclists and/or pedestrians shouldn’t be using a road like that anyway. People also seem to have no problem with speed limits, unless they are enforced. I imagine there are those, who don’t consider themselves to be anti-social vermin at all, who would have no problem vandalising or supporting the vandalism of fixed speed enforcement cameras. You don’t have to look hard to find implicit, or explicit, support of the destruction of these cameras, or even the arson of gatso vans. These data, albeit from a privately held Bushnell speed-detector device, are a cause for concern and give lie to the notion that most drivers are speed limit compliant. The RSA free-speed surveys also show extensive non-compliance and yet we have the oft repeated refrain from AA Ireland that Garda detection systems are akin to shooting fish in a barrel. The penalties for speeding need to be ramped up to take account of nature of the vehicle For example, HGV, bus and coach drivers are driving high mass vehicles so kinetic energy is high, hence the penalty-points and fine need to be set far higher than for saloon car drivers. Titration of penalties according to speed zone limit and actual exceedance also needs to happen. One size for all is no longer appropriate. It’s not a deterrent. I believe the AAs implication is not that speeding isn’t happening, it is that it isn’t a problem. Complaining about enforcement is not based on the idea that most motorists drive legally but on the idea that there is nothing wrong with going 100kph in an 80 or 140 on a motorway.